Detective Ducky is a pillow-shaped duck who knows how to handle himself and is good at finding missing things. 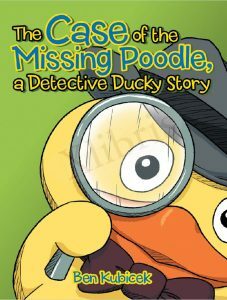 When a young girl’s poodle goes missing, Ducky is on the case. Ducky overcomes his childhood fear of big dogs. He also finds that the poodle is not lost as much as it did not want to be found. The owner learns she should be a little more careful when picking a name for her pet. The story ends well, and Ducky is finally able to get back to his plate of beans. Ben Kubicek lives in Saint Paul, Minnesota with his wife and two sons. He works as a computer programmer and has a degree in Physics. He has varied interests including singing and playing the guitar, training for triathlons, reading and studying the Bible. He began telling Ducky stories to his sons before bedtime. During one of these bedtime stories, a hat was put on Ducky’s head and Detective Ducky was born. He is a born again Christian and welcome any question about who Jesus Christ is. His relationship with God gives purpose and meaning to his life.